The concept of a molecular orbital is readily extended to provide a description of the electronic structure of a polyatomic molecule. Indeed molecular orbital theory forms the basis for most of the quantitative theoretical investigations of the properties of large molecules. In general a molecular orbital in a polyatomic system extends over all the nuclei in a molecule and it is essential, if we are to understand and predict the spatial properties of the orbitals, that we make use of the symmetry properties possessed by the nuclear framework. An analysis of the molecular orbitals for the water molecule provides a good introduction to the way in which the symmetry of a molecule determines the forms of the molecular orbitals in a polyatomic system. There are three symmetry operations which transform the nuclear framework of the water molecule into itself and hence leave the nuclear potential field in which the electrons move unchanged (Fig. 8-10). Fig. 8-10. Symmetry elements for H2O. The bottom two diagrams illustrate the transformations of the 2py orbital on oxygen under the C2 and s2 symmetry operations. For each symmetry operation there is a corresponding symmetry element. The symmetry elements for the water molecule are a two-fold axis of rotation C2 and two planes of symmetry s1 and s2 (Fig. 8-10). A rotation of 180° about the C2 axis leaves the oxygen nucleus unchanged and interchanges the two hydrogen nuclei. A reflection through the plane labelled s1 leaves all the nuclear positions unchanged while a reflection through s2 interchanges the two protons. The symmetry operations associated with the three symmetry elements either leave the nuclear positions unchanged or interchange symmetrically equivalent (and hence indistinguishable) nuclei. Every molecular orbital for the water molecule must, under the same symmetry operations, be left unchanged or undergo a change in sign. Similarly we may use the symmetry transformation properties of the atomic orbitals on oxygen and hydrogen together with their relative orbital energy values to determine the primary atomic components of each molecular orbital in a simple LCAO approximation to the exact molecular orbitals. Only atomic orbitals which transform in the same way under the symmetry operations may be combined to form a molecular orbital of a given symmetry. 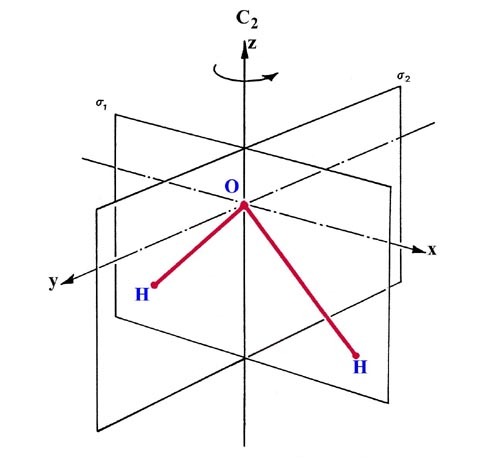 The symmetry transformation properties of the atomic orbitals on oxygen and hydrogen are given in Table 8-3. A value of +1 or -1 opposite a given orbital in the table indicates that the orbital is unchanged or changed in sign respectively by a particular symmetry operation. The 1s, 2s and 2pz orbitals of oxygen are symmetric (i.e., unchanged) with respect to all three symmetry operations. They are given the symmetry classification a1. The 2px orbital, since it possesses a node in the s2 plane (and hence is of different sign on each side of the plane) changes sign when reflected through the s2 plane or when rotated by 180° about the C2 axis. It is classified as a b2 orbital. The 2py orbital is antisymmetric with respect to the rotation operator and to a reflection through the s1 plane. It is labelled b1. under all three operations and is of a1 symmetry while the latter is antisymmetric with respect to the rotation operator and to a reflection through the plane s2 and is of b2 symmetry. The molecular orbitals in the water molecule are classified as a1, b1 or b2 orbitals, as determined by their symmetry properties. This labelling of the orbitals is analogous to the use of the s-p and g-u classification in linear molecules. In addition to the symmetry properties of the atomic orbitals we must consider their relative energies to determine which orbitals will overlap significantly and form delocalized molecular orbitals. The 1s atomic orbital on oxygen possesses a much lower energy than any of the other orbitals of a1 symmetry and should not interact significantly with them. The molecular orbital of lowest energy in H2O should therefore correspond to an inner shell 1s atomic-like orbital centred on the oxygen. This is the first orbital of a1 symmetry and it is labelled la1. 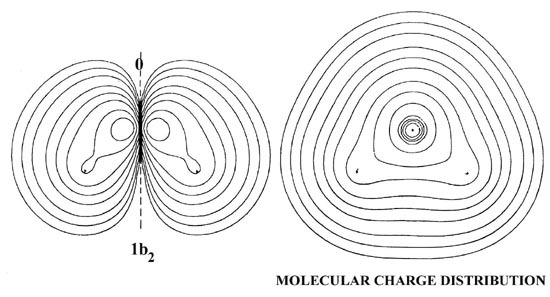 Reference to the forms of the charge density contours for the la, molecular orbital (Fig. 8-11) substantiates the above remarks regarding the properties of this orbital. Fig. 8-11. Contour maps of the molecular orbital charge densities for H2O. The maps for the la1, 2a1, 3a1and 1b2 orbitals (all doubly-occupied) are shown in the plane of the nuclei. The lb1 orbital has a node in this plane and hence the contour map for the 1b1 orbital is shown in the plane perpendicular to the molecular plane. The total molecular charge density for H2O is also illustrated. The density distributions were calculated from the wave function determined by R. M. Pitzer, S. Aung and S. I. Chan, J. Chem. Phys. 49, 2071 (1968). Click here for contour values. Notice that the orbital energy of the la1 molecular orbital is very similar to that for the 1s atomic orbital on oxygen. The 1a1 orbital in H2O is, therefore, similar to the ls inner shell molecular orbitals of the diatomic hydrides. The atomic orbital of next lowest energy in this system is the 2s orbital of a1 symmetry on oxygen. We might anticipate that the extent to which this orbital will overlap with the (1s1 + 1s2) combination of orbitals on the hydrogen atoms to form the 2a1 molecular orbital will be intermediate between that found for the 2s molecular orbitals in the diatomic hydrides CH and HF (Fig. 8-9). The 2s orbital in CH results from a strong mixing of the 2s orbital on carbon and the hydrogen 1s orbital. In HF the participation of the hydrogen orbital in the 2s orbital is greatly reduced, a result of the lower energy of the 2s atomic orbital on fluorine as compared to that of the 2s orbital on carbon. Aside from the presence of the second proton, the general form and nodal structure of the 2a1 density distribution in the water molecule is remarkably similar to the 2s distributions in CH and HF, and particularly to the latter. 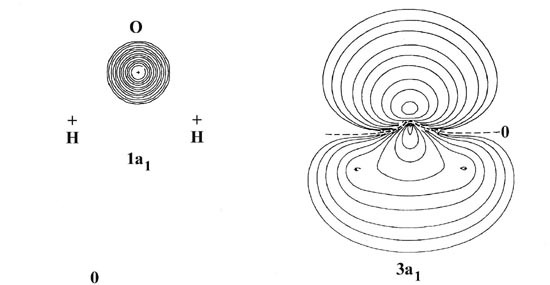 The charge density accumulated on the bonded side of the oxygen nucleus in the 2a1 orbital is localized near this nucleus as the corresponding charge increase in the 2s orbital of HF is localized near the fluorine. The charge density of the 2a1 molecular orbital accumulated in the region between the three nuclei will exert a force drawing all three nuclei together. The 2a1 orbital is a binding orbital. 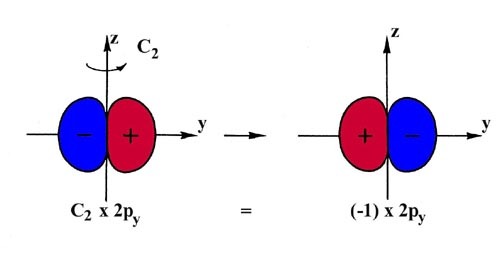 Although the three 2p atomic orbitals are degenerate in the oxygen atom the presence of the two protons results in each 2p orbital experiencing a different potential field in the water molecule. The nonequivalence of the 2p orbitals in the water molecule is evidenced by all three possessing different symmetry properties. The three 2p orbitals will interact to different extents with the protons and their energies will differ. The 2px orbital interacts most strongly with the protons and forms an orbital of b2 symmetry by overlapping with the (1s1 - 1s2) combination of 1s orbitals on the hydrogens. The charge density contours for the lb2 orbital indicate that this simple LCAO description accounts for the principal features of this molecular orbital. The lb2 orbital concentrates charge density along each O-H bond axis and draws the nuclei together. The charge density of the 1b2 orbital binds all three nuclei. In terms of the forces exerted on the nuclei the 2a1 and lb2 molecular orbitals are about equally effective in binding the protons in the water molecule. The 2pz orbital may also overlap with the hydrogen 1s orbitals, the (1s1 + 1s2) a1 combination, and the result is the 3a1 molecular orbital. This orbital is concentrated along the z-axis and charge density is accumulated in both the bonded and nonbonded sides of the oxygen nucleus. It exerts a binding force on the protons and an antibinding force on the oxygen nucleus, a behaviour similar to that noted before for the 3s orbitals in CH and HF. The 2py orbital is not of the correct symmetry to overlap with the hydrogen 1s orbitals. To a first approximation the 1b1 molecular orbital will be simply a 2py atomic orbital on the oxygen, perpendicular to the plane of the molecule. Reference to Fig. 8-11 indicates that the 1b1 orbital does resemble a 2p atomic orbital on oxygen but one which is polarized into the molecule by the field of the protons. The 1b1 molecular orbital of H2O thus resembles a single component of the 1p molecular orbitals of the diatomic hydrides. The 1b1 and the 1p orbitals are essentially nonbinding. They exert a small binding force on the heavy nuclei because of the slight polarization. The force exerted on the protons by the pair of electrons in the 1b1 orbital is slightly less than that required to balance the force of repulsion exerted by two of the nuclear charges on the oxygen nucleus. The 1b1 and 1p electrons basically do no more than partially screen nuclear charge on the heavy nuclei from the protons. In summary, the electronic configuration of the water molecule as determined by molecular orbital theory is 1a212a211b223a211b21 The la1 orbital is a nonbinding inner shell orbital. The pair of electrons in the la1 orbital simply screen two of the nuclear charges on the oxygen from the protons. The 2a1, 1b2 and 3a1 orbitals accumulate charge density in the region between the nuclei and the charge densities in these orbitals are responsible for binding the protons in the water molecule. Aside from being polarized by the presence of the protons, the lb1 orbital is a non-interacting 2py orbital on the oxygen and is essentially nonbinding. The notion of these molecules possessing alternating single and double bonds is a result of our attempt to describe the bonding in terms of conventional chemical structures. In reality all six C�C bonds in benzene are identical and the C�C bonds in the other two examples possess properties intermediate between those for single and double bonds. In other words, the pairs of electrons forming the second or p bonds are not localized between specific carbon atoms but are delocalized over the whole network of carbon atoms, a situation ideally suited for a molecular orbital description. We may consider each carbon atom in a conjugated molecule to be sp2 hybridized and bonded through these hybrid orbitals to three other atoms in the plane. This accounts for the bonding of the hydrogens and for the formation of the singly-bonded carbon network. The electrons forming these bonds are called s electrons. The axis of the remaining 2p orbital on each carbon atom is directed perpendicular to the plane of the molecule and contains a single electron, called a p electron. A simple adaptation of molecular orbital theory, called Hückel theory, which takes the s bonds for granted and approximates the molecular orbitals of the p electrons in terms of linear combinations of the 2pp atomic orbitals on each carbon atom, provides a remarkably good explanation of the properties of conjugated molecules. Hückel molecular orbital theory and its applications are treated in a number of books, some of which are referred to at the end of this chapter.